11408 Private Arthur John Bennett of the 2nd Battalion, the Devonshire Regiment. Son of Henry and Emma Bennett. Born in Chagford in 1894. Died 9 May 1915 aged 21. 6369 Private Fredderick George Bolt of the 2/4th Territorial Battalion (the City of Bristol Battalion), the Gloucestershire Regiment. Son of William and Emma Bolt. Born in Chagford in 1898. Died 7 July 1916 aged 18. 202440 Private Harold William Percival Bolt of the 2/4 Battalion, the Ox. and Bucks Light Infantry. Son of Walter and Ellen Bolt. Born in Hunter's Hill, New South Wales, AU in 1887. Died 22 August 1917 aged 30. Lieutenant William Robyns Bragg of the Royal 1st Devon Yeomanry, attached to the Household Cavalry. Son of William and Amelia Anne Bragg of Chagford; husband of Mabel Mary Bragg (née Ledger) of Battenbury House, Moretonhampstead. Born in Chagford in the June Quarter of 1893. Died 3 December 1917 aged 24. 11339 Private Arthur Endacott of the 2nd Battalion, the Devonshire Regiment. Son of James and Elizabeth Endacott. Born in Chagford in 1896. Died 18 June 1915 aged 19. Captain Wilfred Allan Fleming MC of the 1st Battalion, the Devonshire Regiment, attached to the Royal Flying Corps, 56th Squadron. Son of Allan and Lila Fleming latterly of Chagford; husband of Dorothy Norma Paterson, daughter of Colonel W. F Fairlie, late Highland Light Infantry. Born in Burma in 1891. Died 10 August 1917 aged 26. Awarded the Military Cross. Captain Fleming was gazetted to the ist Devons in 1910, and on the outbreak of the War was at once sent to France. He was mentioned in Despatches and awarded the Military Cross for distinguished services in the Machine Gun Section, in June, 191 5. He was then attached to the Royal Flying Corps, and after a course of training at Tidworth returned to France n 1917. On August l0th, 1917, he was reported missing.' On that day he was sent out with a patrol of four machines over the Menin-Roulers road, east of Ypres. It was a bad day, with a lot of cloud and a forty-mile wind blowing from the west, and it was his first flight on an S.E.5 Aero- plane. At about I p.m. his patrol was attacked by some eight German Albatross Scouts, and a sharp fight began, in the course of which our formation got scattered. On emerging from a cloud the patrol-leader saw Fleming heavily engaged with three enemy planes far to the east. He was putting up a splendid fight, firing at close range on one of the enemy, while another of the Germans was close behind firing at him. The patrol-leader went to his assistance, and together they so settled the Germans that they brought down one and drove the others off. Then the leader and Fleming startedto return home in the teeth of the wind, and in a bank of cloud the leader lost sight of Fleming But from our aerodrome his machine was seen to land behind the German line, and it was thought he must have been forced down by lack of petrol. However, in January, 1918, definite information came through that Fleming was killed in the action of August l0th and was buried in the cemetery of Ledeghan. 50025 Private Henry John Harvey of the 1st Battalion, the Northamptonshire Regiment. Son of George and Rachel Harvey. Born in Chagford in the March Quarter of 1891. Died 18 April 1918 aged 27. 30499 Private George Hosking of the 8th Battalion, the Devonshire Regiment. Son of George and Grace Hosling of Chagford. Born in Plymouth in 1892. Died 29 October 1917 aged 25. SS114116 Stoke 1st Class Richard Mears, of the Royal Navy, HMS Monmouth. Son of Richard and Susannah Mears. Born in Chagford 26 December 1894. Died 1 November 1914 aged 20. 1464 Private William Henry Pardon, of the 5th (Prince of Wales) Territorial Battalion, the Devonshire Regiment. Son of William and Mary Pardon. Born in Chagford in 1896. Died 26 November 1917 aged 21. 2224 Private Alfred Edward Perryman of the 1/5th Battalion, the Duke of Cornwall's Light Infantry. Son of the late Alfred and Lily Pardon; brought up by his uncle and aunt George and Lucy Pardon. Born in Chagford in 1893. Died 30 July 1915 aged 22. 321686 Gunner Samuel Rice of the Cornwall Battalion, the Duke of Cornwall's Light Infantry. Son of Samuel and Emily Rice. Born in Chagford in 1896. Died 17 June 1917 aged 21. 240167 Sergeant George Sampson of the 1st Battalion, the Devonshire Regiment. Son of John and Matilda Sampson of Chagford. Born in Chagford in 1893. Died 6 November 1917 aged 24. 19002 Private William Sampson of the 9th Battalion, the Devonshire Regiment. Son of William and Rose Sampson of Murchington Hamlet. Born in Chagford in 1900. Died 5 October 1918 aged 18. Captain Louis Lionel Smith of the 51st Battalion, the Australian Infantry Force. Died 2 April 1917 aged 30. This man's military papers still exist and apart from details of his military career in France, there is one intriguing piece of information - namely that he was a British Subject who had briefly served in the 1st Battalion of the Devonshire Regiment, probably in a Territorial capacity. We have no indication of how he connects with Chagford. 202328 Private John ("Jack") Stone of the 2/4th Territorial Battalion (the City of Bristol Battalion), the Gloucestershire Regiment; formerly he was 1708 in the Devonshire regiment. Son of William Henry and Emma Stone of Meldon Hall Hotel. Born in Chagford in 1897, Died 19 August 1917 aged 20. 24447 Private William Henry Underhill of the 6th Battalion, the Dorsetshire Regiment. Son of Henry and Emma Underhill. Born in Chagford in the June Quarter of 1897. Died 12 April 1917 aged 20. 273330 Gunner Richard George Proute Holmes of the 3rd Reserve Brigade, the Royal Field Artillery. Son of Richard and Lucy Holmes. Born in Chagford in the September Quarter of 1888. Died 1 November 1918. Buried in the churchyard at Chagford. Outside the church, an ancient cross has been utilised as a War Memorial for outside gatherings. 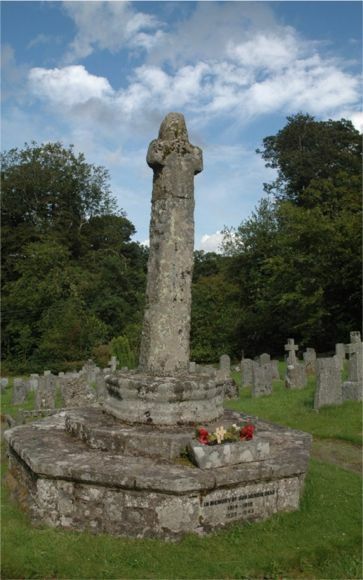 Chagford's main war memorial is the War Memorial Playing Fields.